Recipe from Valerie Simpson, Singer & Songwriter, Spokesperson, National Minority Health Initiative. Valerie tells us this is a favorite of hers that she first tried at our National Speaking of Women's Health Sponsor Recognition Dinner. 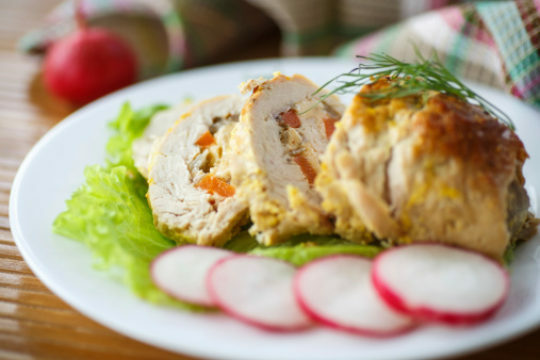 Enjoy the taste of chicken rolled in a warm crust and peppers. Place chicken, boned side up, on cutting board. Working from center out, pound chicken lightly with wooden mallet to make cutlets about 1/4- inch thick. Place a rosemary sprig, 2 stalks of asparagus and 2 strips of red pepper in center of each cutlet. Tuck in sides of each, and roll up (like a jelly roll), pressing to seal well. Skewer or tie securely. Coat rolls in flour. Brown lightly in olive oil and remove from skillet, transferring to baking dish, lightly coated with cooking spray. Cut each “roll" into slices.